Summary: The US Dept. of Transportation (NHTSA) has these publications and more available free for downloading on line. These materials are all on the NHTSA site. You can also download them in .pdf format for printouts by clicking on the link "Printable version" on each page. Here we have links to the NHTSA server except for a few .pdf files we did not find on their server. You should check the NHTSA page for new ones that we don't know about yet. Activities for children from 4 to 7 and for those from 8 to 11 years old. All on line for downloading. Includes coloring pages, connect-the-dots, word find, crossword, word scramble and more, with nice color graphics if your printer can handle them. Also available in Spanish. 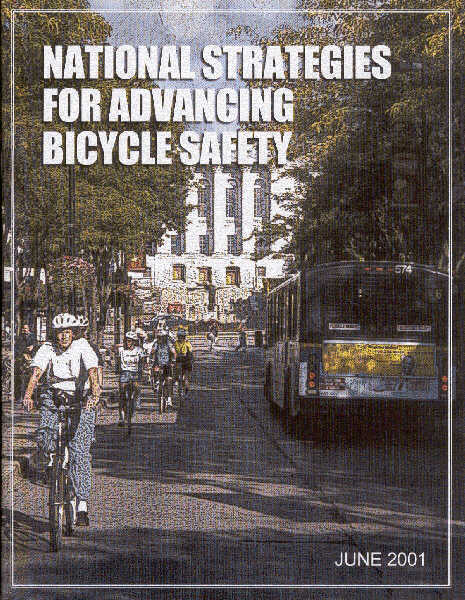 One of DOT/NHTSA's best publications. In addition to egg drop, melon drop and hammer demos, it has a Pledge form. It has photos of each step. Probably best for late elementary to mid-school kids. Sections on Safe Riding Tips, Rules of the Road and Sidewalk Riding. 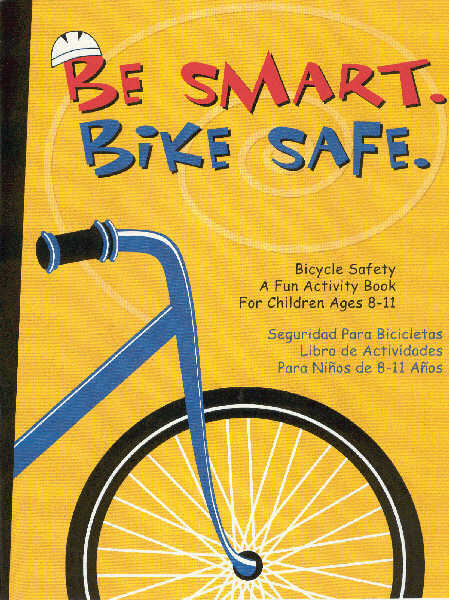 On the Toolkit CD as nhtsakids.pdf Also available in Spanish as Los niños y su seguridad al montar en bicicleta. The .pdf file is on our Toolkit CD as spanishkids.pdf. Seven ways to bicycle safely. Includes info on helmets, bike maintenance, riding gear and safe riding practices. (DOT HS 810 773, May 2007) The .pdf file is on our Toolkit CD as nhtsa7.pdf. This three page flyer includes a message for parents about bicycle safety. Facts about bicycle-related crashes, injuries and fatalities, along with tips on how a parent can help prevent them from happening are included. Typical crash situations between motor vehicles and bicycles are explained. (2007) The .pdf file is on our Toolkit CD as nhtsacrash.pdf. Traffic Safety Facts: Laws - Bicycle Helmet Use Laws. This one is dated April, 2004, and does not have New Hampshire or New Mexico in the list of State laws. Lessons learned from Austin, Texas; Jacksonville and Duval County, Florida; the State of Maryland; the State of Oregon; Port Angeles, Washington, and Seymour, Connecticut. Also available as a "printer friendly" but very large 219 page .pdf file. NHTSA has five .wmv videos online on the DOT site. Scroll down to Videos and Clips. Send us an email with your postal mailing address if you need the DVD version. There is no charge for it, and we included some other videos as well. These publications are just a few of the ones on the NHTSA site. Please note that we do not have copies of any of them for distribution on paper, but can send the videos on DVD.